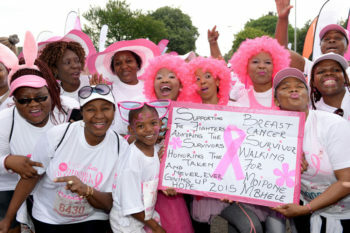 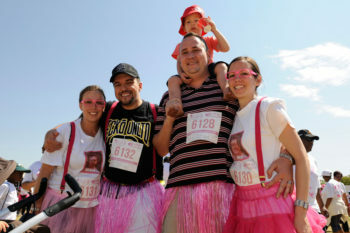 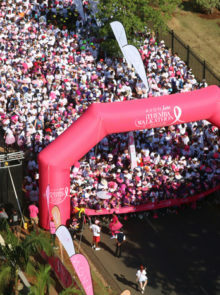 On 25 October 2015 Marks Park Sports Complex was abuzz with activity with over 25 500 men and women flaunting their pink and white outfits and quirky accessories, while doing their part in the fight against breast cancer. 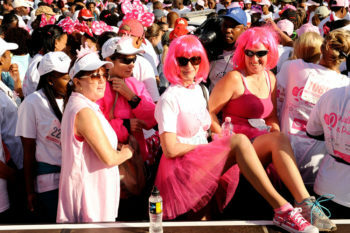 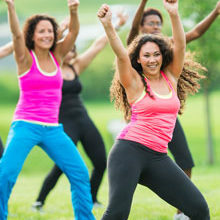 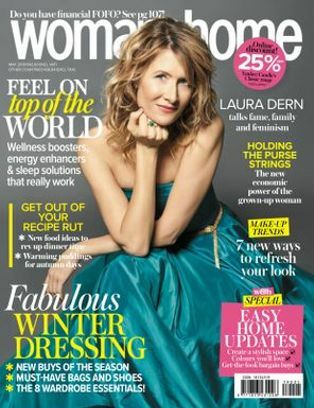 According to Avon PR manager Vicky Saunders-Flaherty, it is estimated that the media exposure leading up the 2015 event reached over 15 million people. 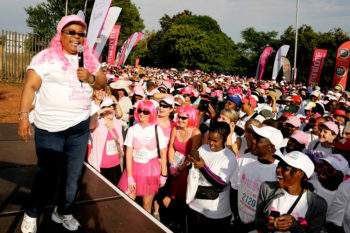 “The media exposure (w&h, Kaya FM and etv Sunrise) is critical to helping save up to 30% of lives that may have been lost because of breast cancer,” she says. 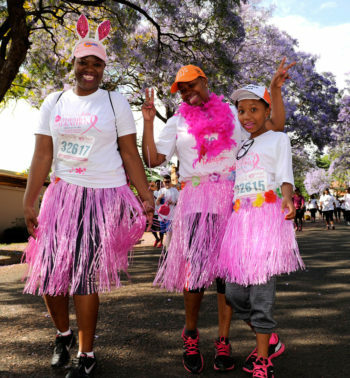 Apart from that, the w&h team also managed to raise R34 440 by selling w&h ribbons which participants could purchase when they registered. 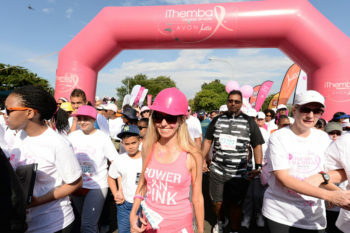 Thank you to all the w&h readers who supported this initiative, the money will be donated to the Breast Health Foundation. 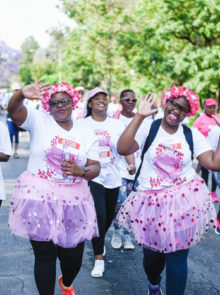 Once again participants had the choice to walk the 5km or 8km through the leafy suburb of Emmarentia with many bringing their four-legged friends along for the morning’s activities. 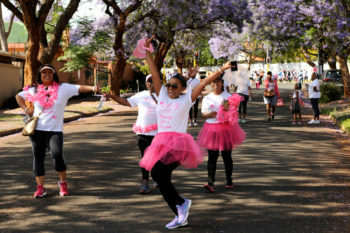 As for entertainment, performances by Tokyo Groove, Toya Delazy, Thembisile and Nomisupasta Thiwe had the crowd dancing and full of energy. 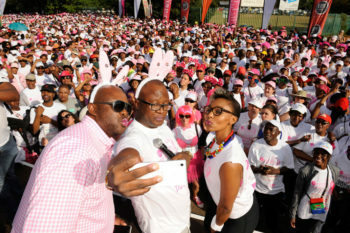 Kaya FM presenters, Katlego Mabusela and Sotho Lenkoe, – who were the emcees – also wowed the mass with their lively act and to add extra glamour, a host of beautiful personalities took part in the walkathon such as the bubbly radio DJ Pabi Moloi, actress and breast cancer survivor Lillian Dube and radio presenter Azania Mosaka to name but a few. 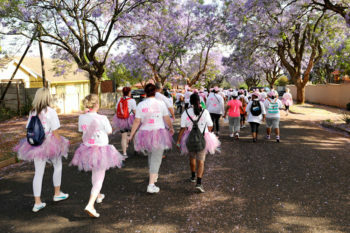 Breast cancer survivor Velisa Sishuba (18) shared her experience of being diagnosed at the age of 17 and encouraged women to get to know and understand their breasts so they can immediately recognise changes and seek medical help as soon as possible echoing Avon’s key message that early detection saves lives. 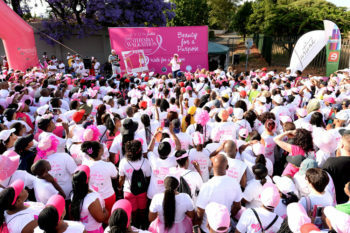 To add another victory to the 10th annual iThemba Breast Cancer Awareness Walkathon, a world record attempt of the most number of people to apply lipstick at the same event, known as #PoutForAPurpose, was achieved and had both men and women displaying the beautiful shades of Avon lipsticks. 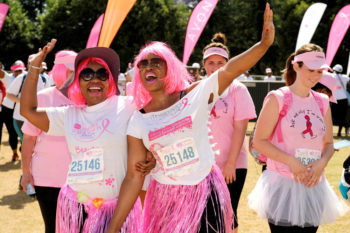 The day was a great success and w&h couldn’t be prouder to be associated with such a worthy and fun event. 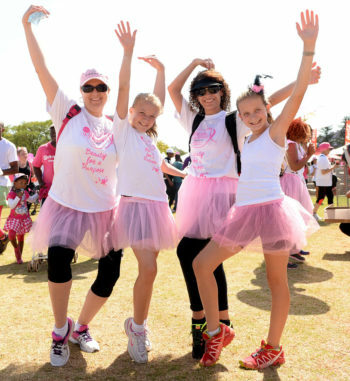 Thank you for your support of this amazing cause; you have made a real difference! 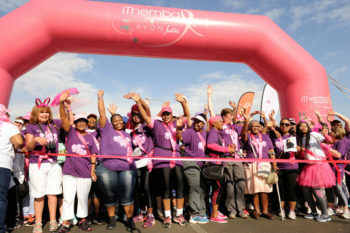 To date, R20 million has been raised in South Africa through the sale of iThemba products and has been donated to the Breast Health Foundation/ Bosom Buddies (za), Look Good… Feel Better (lgfb.co.za) and the Cancer Association of South Africa (cansa.org.za). 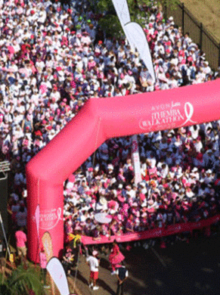 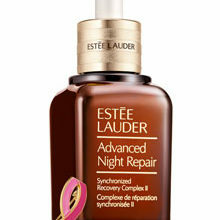 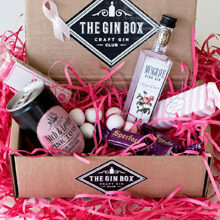 Avon host breast cancer awareness events in over 20 of it markets worldwide. 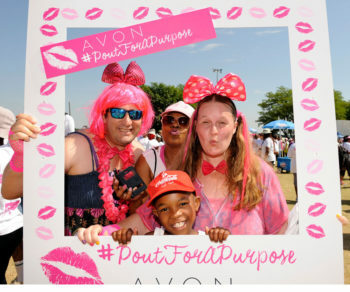 Avon is the world’s largest philanthropic supporter of women’s causes and has donated over $850 million globally towards breast cancer research, medical care, education and awareness.